Hit a golf ball from tee to green on different holes is a new weekly challenge in Fortnite Battle Royale. This is the second challenge that requires a toy in this season, previous being the one during week two where you had to shoot basketballs. This challenge, however, requires players to have a golf ball toy. The toy is unlocked at the battle pass tier level 27. To complete the weekly challenge head to the new season five location Lazy Links. This is where you can complete the season 5, week 5 challenge – Hit a golf ball from tee to green on different holes. 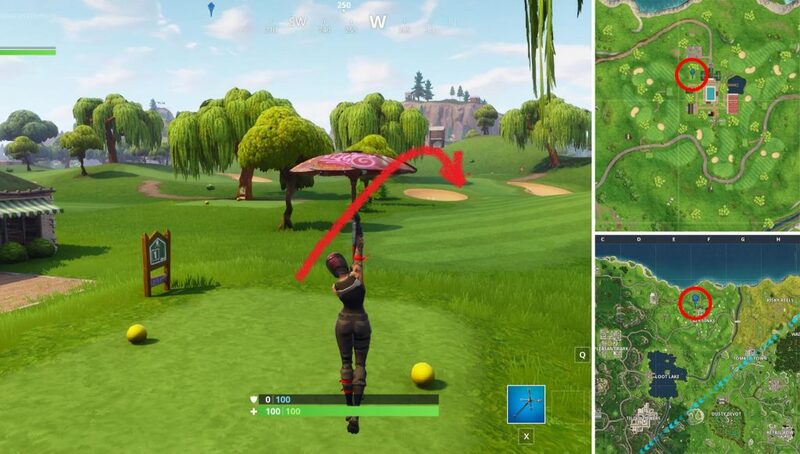 All golf ball tees locations are found within one section of the map, in Lazy Links. This new location was added in season 5 and is positioned in the north part of the map, in place of the old Anarchy Acres. Apparent progress made an old farm into a luxurious area for the players to enjoy golf, tennis and even have some pool fun. You need to hit the golf ball five times from tee to green, where the final hole is found. You can do this with help of nine golf courses. If you look at the map of Lazy Links, you can distinguish these golf ball tee locations by their, roughly rectangular shaped, grass patches. Usually there is a small dirt road leading to them, but it’s not always the case. The first three golf pars are found just west of Lazy Links. The first one is next to the big mansion. When you stand on it, there are two big green ball markers that make it a starting point. They will continue to show up on each of the other eight golf pars. The green part, that you have to hit the golf ball toward, is always in the distance, across from the starting point. You can recognize it because of the hole’s flagstick. It is always positioned on the par’s end goal. The second golf ball tee is a bit to the west of the first one’s flagstick. The third is closer to the mansion, and, subsequently, closer to the first golf par. Look for the fourth golf par on the southwest part of Lazy Links, just south from the road. The fifth golf starting tee is southwest from the tennis court. It might be the most dangerous one, as you are on an open field, close to the compound, vulnerable to shots. The sixth golf tee is south of Lazy Links, and south from the main road. If you know about that shack with a golden chest in its basement, it is east of it. To get to the seventh one, follow the road to the east, and on your left you’ll find it. The eight golf tee is on the eastern side of Lazy Links, just east from the tennis court, close to the main road. The ninth and last golf ball tee location is on the farthest northeastern side of Lazy Links, at the edge of the compound. If you are coming from the eastern direction, it might be considered as the your first and best option for landing and starting working on completion of the weekly challenge – Hit a golf ball from tee to green on different holes.